Size: Landscape 23 x 29 cm. Our guest books contain 30 pages for the couple to be to fill in such as the family tree, how Mom and Dad felt the day they found out Mom was pregnant, recording of doctors visits, scans, baby's details at birth, place for baby's footrpint & handprint, etc. 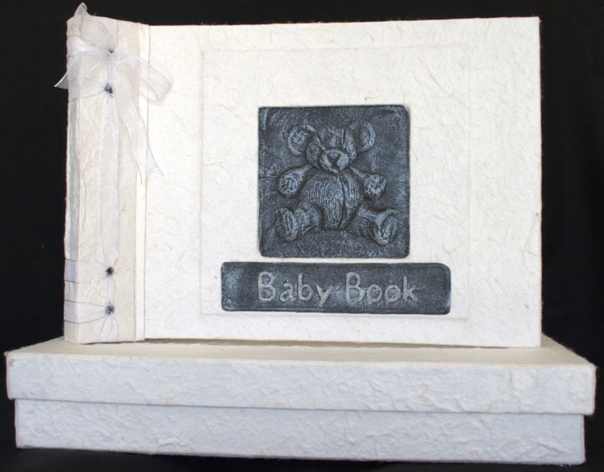 You can choose the colour of the guest book from the handmade range of papers. A matching storage box is included.